Some might consider Elizabeth of York the “Mother of the Tudors” since she had three children who held the title of King or Queen consort who were Tudor by birth. How much do you know about this Plantagenet princess? When was Elizabeth of York born? Elizabeth belonged to the House of York. What is the symbol of the House of York? The White Rose of York emblem dates back to the fourteenth century, and has since been adopted as the official symbol of Yorkshire as a whole. Edmund of Langley was the fourth surviving son of King Edward III and Philippa of Hainault. It was through his younger son that the House of York made its claim to the English throne in the War of the Roses. Who was Elizabeth of York’s father? Edward IV was the first Yorkist King of England after deposing the mentally unstable Lancastrian King Henry VI, who later died under suspicious circumstances while imprisoned in The Tower. 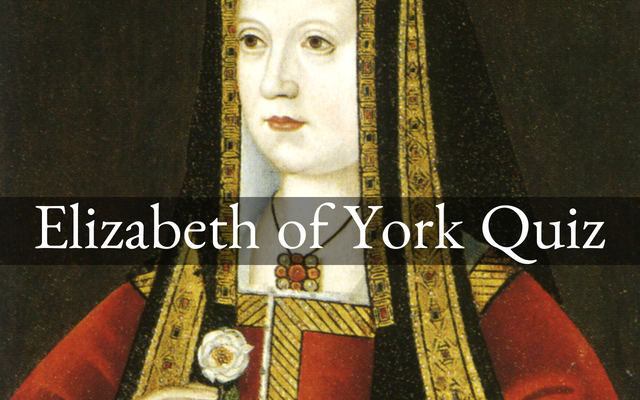 Elizabeth of York was the daughter of a king, but also the niece of a king. Who was her uncle? Richard III usurped the crown and is a suspect in the murder and disappearance of The Princes in the Tower. Including Elizabeth, how many children did Edward IV have with his wife, Elizabeth Woodville? Elizabeth of York was the eldest of ten children born to Edward IV and his wife Elizabeth Woodville. Richard III declared the children of his brother, Edward IV, as illegitimate in 1484 by an act of Parliament. What was this act known as? Titulus Regius (King’s Title) removed many obstacles in order for Richard III to become King instead of his nephew, the de-facto King Edward V.
Elizabeth of York had 2 younger brothers who mysteriously disappeared after being held in the inner apartments of the Tower. When was their last reported appearance? 12-year-old King Edward V was escorted by his uncle, Richard III to The Tower on 19 May 1483, and was later joined by his younger brother, 9-year-old Richard, Duke of York on 17 June 1483. They were never seen alive again and their bodies were never recovered. On what grounds did Richard III have Parliament declare Elizabeth and her siblings illegitimate? Edward IV was alleged to have promised marriage to Lady Eleanor Butler if she agreed to sleep with him. She consented, and they were allegedly married in secret with no witnesses. How old was Elizabeth when her father Edward IV died? Elizabeth of York married King Henry VII on what date? After procuring a papal dispensation and repealing the Act of Titulus Regius, Henry VII married Elizabeth of York at Westminster Abbey. Elizabeth of York was not crowned Queen of England alongside her husband on 30 October 1485. How much time passed before her coronation? Elizabeth of York was crowned Queen of England on 25 November 1487. In total, how many children did Elizabeth of York give birth to? Of her seven children, only four survived childhood and 3 survived to adulthood. Where was Elizabeth of York born? What is the significance of the date 2 April 1501? Elizabeth’s eldest child and son, Prince Arthur, along with his newlywed wife Katherine of Aragon, became ill in mid-March 1501 with an unknown illness described as “A malign vapour which proceeded from the air.” Katherine recovered, but her young husband passed away a mere 6 months after their wedding. He was 15 years old. Despite being Queen of England, Elizabeth of York did not wield much power or influence due to her domineering mother-in-law. Who was she? Margaret Beaufort relinquished her claim to the throne of England in favour of her son Henry VII. She was referred to in court as “My Lady the King’s Mother,” and she had much more power and influence than her daughter-in-law. She refused to be seen as less than the queen, and wore fabrics of equal value to the queen’s and walked only a half pace behind her. The average life expectancy in the early 16th century was much lower than it is today. Elizabeth of York was 37 years old when she died. What was her cause of death? Elizabeth of York gave birth to her final child, Katherine, on 2 February 1503 in the Tower. The newborn princess died on 10 February, and Elizabeth died of a post partum infection on 11 February-her 37th birthday. After her death, the Tower of London was abandoned as a royal residence and all future births took place in various palaces. Elizabeth of York was briefly engaged when she was just three years old. To whom was she engaged? Elizabeth was briefly engaged to George Neville, but the engagement was called off when George’s father John supported his uncle the Earl of Warwick in a rebellion against King Edward IV. In 1477 at the age of eleven, Elizabeth, along with her mother and her paternal aunt the Duchess of Suffolk were all named to which order? Founded by King Edward III in 1348, The Order of the Garter is the oldest and highest order of chivalry in the British honours system. After Margaret Beaufort was named to the order in 1488, no women were added until Queen Alexandra in 1901. Elizabeth of York inherited her fair hair and complexion from her parents. Her children and grandchildren all exhibited the classic Tudor trait of red/reddish gold hair that is often associated with the dynasty. After the death of Prince Arthur, how did Elizabeth comfort her grieving husband? After Arthur died, Elizabeth conceived her final child, a princess named Katherine, who was born on 2 February 1503. Unfortunately the newborn baby passed away on 10 February, and Elizabeth passed away on 11 February from complications due to a postpartum infection. Henry VIII had three surviving legitimate children from 3 marriages, Margaret had two children from 2 marriages, and Mary had three children from her second marriage. All of Elizabeth’s children who survived to adulthood became monarchs. In which countries did they reign? Henry VIII was King of England, Margaret was Queen of Scotland by marriage to King James IV, and Mary was briefly Queen of France as wife to King Louis XII. Elizabeth had nine younger siblings. How many of them outlived her? Cecily died in 1507, Anne died in 1511, Bridget died in 1517 and Catherine died in 1527.